S’mores have been blowing up dessert lists for several years. Menu mentions of this nostalgic sweet have grown by 133 percent since 2010, according to Datassential MenuTrends. 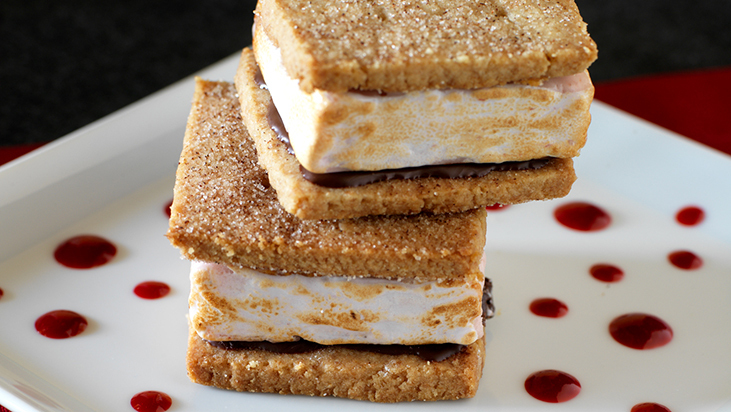 Chef Walter upgrades the campfire treat with house-made graham crackers and raspberry marshmallows. Prepare Raspberry Marshmallows: Line a 12-inch by 9-inch pan with parchment, brush with vegetable oil. Soften gelatin in water. In deep saucepan, combine 1 cup sugar with corn syrup. Place over low heat; heat until sugar melts. Continue cooking until candy thermometer reaches 240°F. In mixer bowl, whisk egg whites until foamy. Add remaining 1/3 cup sugar; beat to soft peaks. Add raspberry puree and mix briefly to leave light and dark swirls in marshmallows. Scrape mixture into prepared pan. Smooth top and cool. Dip spatula in hot water and dry, then smooth the top of the marshmallows. Depth will be about 1 1/8 inches. Set aside for at least 6 hours or overnight to set. Sift confectioners’ sugar and cornstarch together onto clean parchment. Lifting the parchment, turn marshmallows onto the clean parchment. Remove parchment and sift confectioners’ sugar onto marshmallows. Cut mixture into squares or use cookie cutters in the same shape as the graham cracker, and gently sprinkle with sifted confectioners’ sugar mixture. Store covered for up to one month on sifted confectioners’ sugar. Prepare Graham Crackers: Preheat oven to 350°F. In medium bowl with mixer at medium speed, cream butter, brown sugar, sugar, honey and vanilla until smooth, about 20 minutes. Sift dry ingredients. Add to butter and mix to incorporate. Chill 1 hour. Roll dough until 1/16 inch thick. Using the same cutter as the marshmallows, cut into 16 pieces. Place on cookie sheet. Using a pastry docker or two forks, press a few holes into each graham cracker. Bake for 11 minutes. Cool completely; store airtight. To assemble, spread melted chocolate on backs of graham crackers. Sandwich a marshmallow in between two crackers, chocolate sides touching the marshmallow. Place on a plate and sprinkle with powdered sugar. Garnish with red raspberry puree.